For questions about open burning or to report an open burning complaint, please contact the Air Quality Regional Office for your county. The Open Burning Rule is one of North Carolina's oldest air quality regulations, first adopted in 1971. The rule prohibits much outdoor burning and sets conditions for allowable fires. 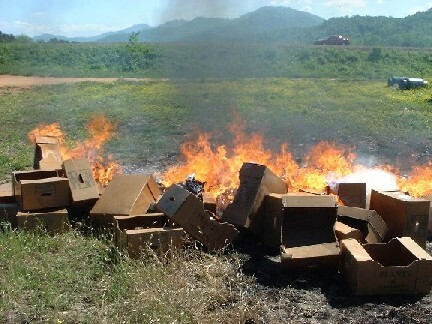 Under the rule, it is always illegal to burn trash and other non-vegetative materials. Leaves, branches and other plant growth can be burned under certain conditions. Violators can be fined up to $25,000 or more. NOTE: The N.C. General Assembly has amended several sections of the Open Burning Rule over the past two sessions. In the 2014 session, legislators removed the restriction on burning stumps and logs over 6 inches in diameter for homeowners. Lawmakers also changed the rule so that smoke from allowable residential burning of large logs and stumps will not be considered a nuisance. More details can be viewed at Regulatory Reform Act of 2014, Sect. 24 (Open Burning Without an Air Quality Permit). In the 2013 session, legislators amended restrictions on the transport of vegetative matter for outdoor burning. Under the change, vegetation from land-clearing operations may now be transported off-site and burned in another location under certain circumstances. Such burning may be allowed if the material is: burned not more than four times a year, located at least 500 feet from occupied buildings, and contains no more than two piles less than 20 feet in diameter. More details can be viewed in Regulatory Reform Act of 2013, Sect. 28 (Open Burning Without an Air Quality Permit). View or download brochures, fact sheets, presentations, and other information about North Carolina's Open Burning Rule. View a list of questions and answers about open burning and associated policies in North Carolina. View the contents of North Carolina's Open Burning Rule (15 NCAC 2D .1900). Download and submit forms to the DAQ for consideration to burn land clearing debris within 500 feet of occupied dwellings. Download fire training forms and other fire department related information. For questions about air quality related to open burning, please call (919) 707-8400 or the DAQ regional office for your county. Teachers and students can learn more about the dangers of open burning to both our environment and our health in this section. Teachers will find three fun, engaging, and student-centered classroom activities that they can easily bring into their classrooms. Click to learn more about the "Breathe, Don't Burn' Project. Follow this link to find more information on open burning from the U.S. Environmental Protection Agency, North Carolina Forest Service, and N.C. Division of Pollution Prevention & Environmental Assistance. EPA has much information on the health and environmental effects of smoke from open burning. Forest Resources issues burn permits and fire danger alerts.